I don’t know about you, but when I decide to clean something, I go all in. On Saturday morning, we enjoyed cornmeal and blueberry pancakes from a cookbook Middle Son gave me for Christmas (the recipe needs some tweaking but it has potential.) And as we ate, I kept looking over at the kitchen and thinking about the pent-up post-holiday clutter that never seemed to quite go away no matter how many times I glared at it. Hmmmm. So as soon as breakfast was over, I set in to clean, and clean I did. The dishwasher and oven cleaned themselves, but every surface and several cabinets got some one-on-one time with me. 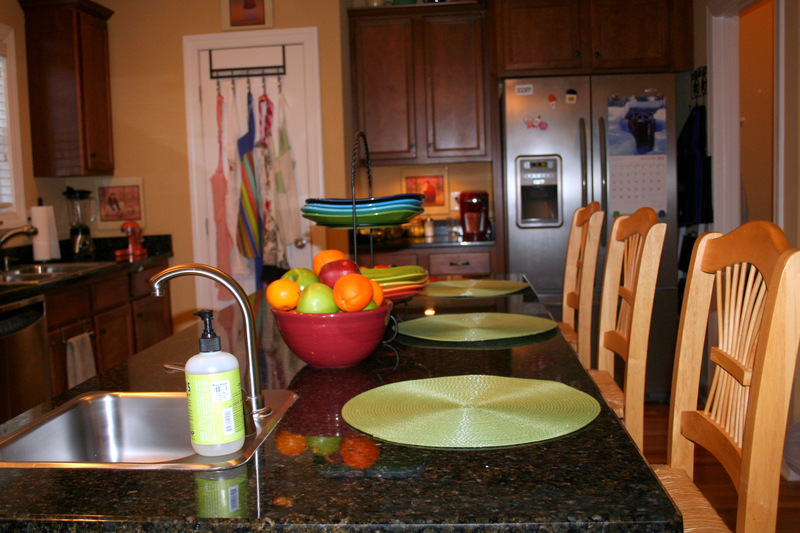 Every countertop was completely cleared, scrubbed and buffed. The backsplash areas got a damp cloth and stubborn stains got treated to the magic of a Magic Eraser. The plasticware cabinet was overhauled and the coffee grinder was relegated to the garage. Every now and again, I might need it…but with the arrival of the Keurig, those times are few and far between these days. As I wiped off the top of the microwave, a strip of plastic suddenly appeared…it was one of those protective strips they put on in the factory so it doesn’t get scratched from store to installation. For shame. This house was finished over six years ago and we’ve lived here for almost two years….and I’m just now finding and removing it? I *do* wipe that ledge atop the microwave occasionally, I swear. The finishing touch was to scrub and buff the sinks. I had seen this tip on Pinterest and decided to give it a whirl. Well, at least the last part. I used my trusty Barkeeper’s Friend to do the scouring, then did the olive oil buff job. They are definitely shinier and I hope they’ll stay a little cleaner…for at least a few days. 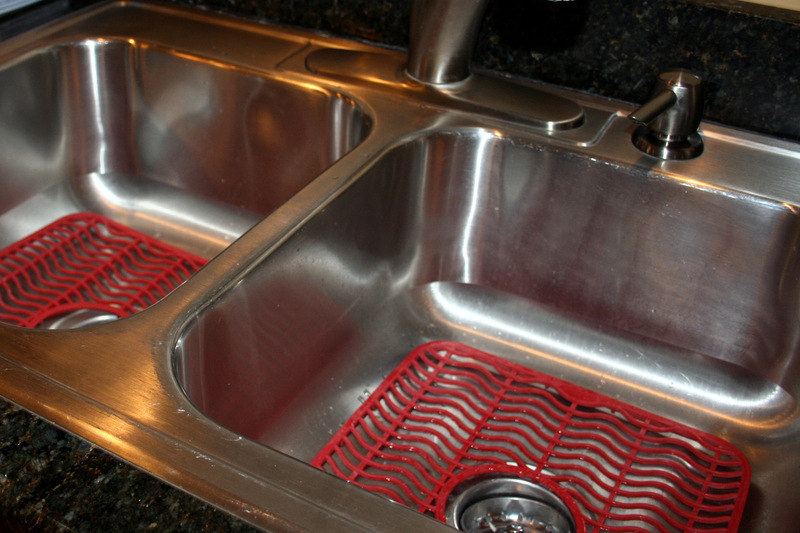 Do you clean your sinks? I hear horror stories of people who don’t…really? I scour mine at least a couple times a week, and definitely after any raw meat has dripped or dribbled in a basin. 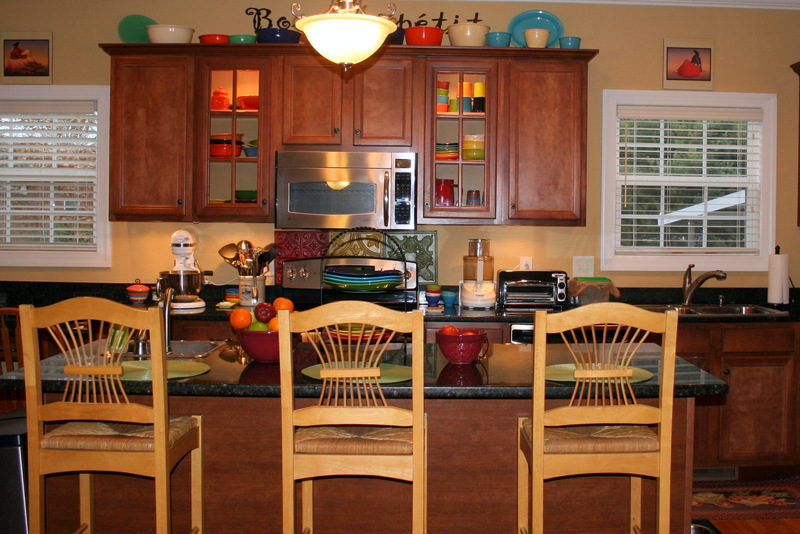 Even clean, the kitchen is visually busy. My rainbow of Fiestaware isn’t exactly a soothing monochromatic color scheme and I use tools, prep bowls and appliances too often to keep them tucked away in cabinets. But when it’s clean, it definitely sets a better “tone” for our open floor plan. And I know the kitchen won’t stay this clean for long. We work hard, play hard, and eat hard in this area and I wouldn’t have it any other way. For now, we’ll do what we can to maintain it….and in a few weeks, I’ll be running a sinkful of scalding hot water and doing it all over again. After the kitchen was finished, Swimmer Girl and I headed out for pedicures and a movie (Les Miserables). Five hours of uninterrupted mother-daughter weekend time = awesome. I hope your weekend was filled with some activities that gave you a sense of satisfaction, and some opportunities to savor a special moment. Those are the best weekends, in my book. P.S. Yes, I’m still keeping up with my daily Bible readings, which is proving extremely convenient since they are posted on Facebook every day. Last week’s passages blazed a trail through the lives of patriarchs, and I’ve once again pondered our oh-so-human frailties: deception, favoritism and envy marred the relationships of Abraham, Isaac, Jacob and their families. This week will focus on Joseph…and his ability to see God and good in the trials of life. We could all learn a lesson or two from his story. Consider your suspicions (or worst fears) confirmed: I am one of “those” people…you know, the ones who like weird stuff you find in the nooks and crannies o f the English language. And the odd tidbits of history, which – by the way, are not considered factoids. Because a factoid refers to invented or at least unverified facts, not fact snippets. Yeah. I’m one of those. 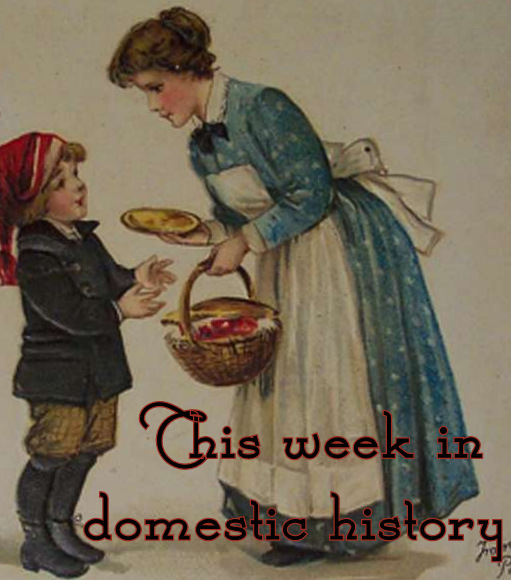 Anyhoo, I got to looking around the vast world wide web not too long ago, and realized there is a lot of daily domestic history out there. Punchbowl does a cute widget with foodie holidays and trivia but it was giving me fits when I was still on Blogger, and WordPress just plain refuses to try to play nice with it. 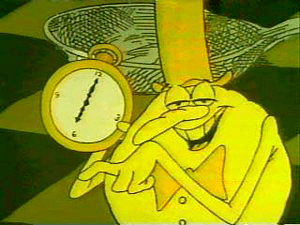 So instead I’ll try to occasionally regale you with things that I find historically interesting, funny, or both. On November 26, 1867, the first refrigerated rail car was patented. Hello, iceberg lettuce! Also on the same date in 1895, the Hawaiian Sugar Planters Association was formed. C’mon, admit it . If you’re of a certain age, you’re involuntarily humming the “C&H…Pure cane sugar…from Hawaii….” jingle, aren’t you? And – for the romantics among us, “Casablanca” premiered in 1942. Sigh. November 28 is National French Toast day. Like anyone ever needs an excuse to eat French toast.. On November 29, 1942, the U.S. began rationing coffee. Now THAT would be a sacrifice. Take my pantyhose, but leave me my coffee. On November 30, 1907, Pike Place Market opened in Seattle. Foodies unite. December starts out with apples: December 1 is Pie day and Red Apple day, December 2 is Fritters day and December 3 is Apple Pie day. I don’t know when or if there’s an apple pancake day, but stay tuned: tomorrow is a knock-your-socks off recipe for anyone who wants some apple-y goodness for breakfast. Feel free to tuck a few of these back in the recess of your memory. They can come in handy the next time there’s a lull in the conversation. You, too might become known as one of “those” people. On November 4, 2008, the “Spirit of the Titans” song was played during President Barack Hussein Obama’s acceptance activities. 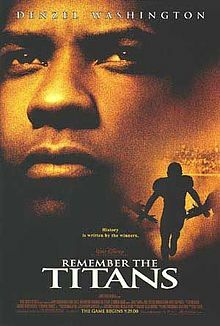 This theme from the 2 000 movie “Remember the Titans” could have been a fitting foreshadowing of what our first country’s first black president could have achieved to unite us and push us to greatness, against a backdrop of turmoil, confusion and controversy. We could be celebrating a hardfought victory over the storm of economic and social problems that were brewing back then, had this President actually taken some notes from Herman Boone’s playbook to which he gave lipservice. Granted, the Disney movie takes some artistic license to score sentimental points, and the messy realities of a long and difficult football season are neatly encapsulated in a running time of 119 minutes–less time than an average real-life football game. And it’s football, not real life. The essential qualities that made Herman Boone and his 1971 Titans team so remarkable were captured in this movie that Mr. Obama said “makes men cry.” To which I wonder: were Mr. Obama’s tears for the superficial, emotional poignancy of the movie, or the instinctive reaction of watching coaches and players dig deep inside themselves, put aside petty differences and overcome the odds to rise to greatness? 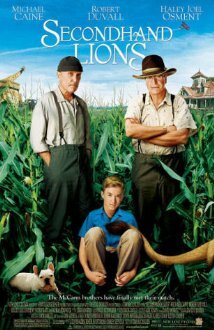 Coach Boone was given the daunting task of creating a winning team out of an involuntarily integrated pool of players. He saw their skin color and their prejudice for each other (yes, Mr. Obama, discrimination is a two-way street), but he also saw beyond those obstacles. Coach Boone saw within these young men the ability and desire to win at a sport they played well. And so he systematically broke down the walls of racial discrimination until they too could see their similarities as well as their differences. He did this by expecting the same level of performance from every player, regardless of race. He was a tough coach, demanding and giving dignity and respect. The movie suggests that Mr. Boone had an unrelenting determination to succeed; his career hung in the balance of each game. He questioned his own ferocious ambition and held himself responsible for its influence on his decisions. Were you paying attention, Mr. President? Great leaders have self-awareness of their faults and weaknesses, and they work to overcome them. To fail in this regard is to fail and fall into the trap of vanity and petty petulance that has plagued every wanna-be world leader in the annals of history. It is evident that Mr. Boone implicitly understood Adam Smith’s “Invisible Hand Theory.” You know, that quaint idea that individuals pursuing their own interest frequently promote the good of society. By channeling his passion and desire to win into creating a team of individuals who desperately wanted to win, both he and the TC Williams Titans won, and won big. It wasn’t magic, it was what our Founding Fathers and every generation of Americans have known and celebrated until recent times: society succeeds when its individual members can pursue and achieve success. By its very nature, success is competitive, even brutal. It is a zero-sum game: not everyone can or will win. Compassion is the yin to the yang of competition and you shouldn’t have one without the other, but you have to keep them in their proper perspective. Complacency has no place in a universe fueled by competition and tempered with compassion. Ever. In sharp contrast, today we have a president who has sharply divided us with his actions and rhetoric, in the name of hope, change, and fairness. Today, Americans who have little are told two big lies: one, they should resent those who have what they do not. The second lie is even more insidious: only a beneficent government is capable of meeting their needs. Not themselves, nor voluntary – and temporary – charity from their friends and families. Rugged individualism and self-determination are no longer sterling qualities, but anathema. Complacency has been baked in and inbred. Those who have any measure of wealth are marginalized, demonized, excoriated and remonstrated by this administration, which tells them they should not rely on themselves, because self-sufficiency is a delusion and they did not create their own wealth, no matter how big or small. Anyone with more than anyone else should be embarrassed and ashamed to want to keep what they have, because it isn’t fair to not share. Mr. Obama, didn’t your mother or grandmother teach you that life is not fair? Mine did. I suspect Herman Boone’s mama told him the same thing. In Coach Boone’s gridiron world of 1971, young men were individually held responsible to an uncompromising standard of excellence by their coach, their fellow players and themselves. Less than 100% effort was not acceptable to the team or to themselves, and their teammates and coaches demanded accountability. No excuses. No blaming others for your shortcomings. Each man had to do his best in order for the team to succeed. Fast-forward four decades and the message of the day is that we are all victims, helpless to make our own way, and not responsible for the muddled lives we live. Half of Americans now lives off the largesse of the taxpayers. I wonder how long it will be until the other half throws in the towel, too? Coach Boone had his enemies, scoffers and naysayers but he proved them wrong by rising above their opposition and bringing people together. I believe it was within our first black president’s grasp in 2008 to reunite America into a strong and powerful nation, but as the clock winds down on his first (and possibly only) term, it appears it was an opportunity squandered on a leader who is prone to apologize for his country and splinter and divide us along race, party and socio-economic lines. I love “Remember the Titans.” I just wish my President had seen the same movie I did. Maybe this concept is the key – or one of the keys – to unlocking the mystery as to why our society is failing miserably at the lofty goals of humanity, such as kindness and compassion, common sense and common decency. We are what we consume. Look around: it is nearly impossible to have a civilized discourse on politics or religion unless we are among like-minded folks. Disagreements are almost always going to become disagreeable and devolve into personal attacks. Ironic, isn’t it? Tolerance is a by-word of this generation, but we are anything but tolerant of anyone who has a different perspective than our own. We’re quick to tag people as bigots, haters or ______-phobes if they don’t lock-step with the current way of thinking. We are super-sensitive to anything that might be construed as a racial slur and we demand the ousting of any public figure whose off-hand remarks have the slightest tint of racial bias. But we jump on opportunities to tear down each other individually, and take pleasure in watching actors deliver scathing lines in movies and television programs. We ballyhoo about the rise in bullying, but where do we think children learn how to be hurtful to each other? Hint: it’s not a defective gene, y’all. We are what we eat. Maybe repeated exposure to that commercial is why I am now a huge fan of eating good food in good company. My wish for everyone is to regularly eat food that is freshly prepared and consumed by families who make time to sit down and enjoy the ritual of breaking bread together, because that’s how we connect to others. Along the same lines, I guess I’m also a fan of being picky “eaters” when it comes to what we consume through our senses, too. It’s time to refine our reading and viewing diet, and train our senses to enjoy stories that dig deep into meaningful subjects and have some substance. Even when the language is centuries-old and we have to grapple with arcane words to grasp their meaning. It’s akin to taking time to prepare a home-cooked healthy meal instead of noshing on junk food. Sure, the junk food tastes good every now and again. And we enjoy skimming through superficial, self-centered magazine articles or devouring novels that pass for modern literature today. But neither of those should be what we consume day in and day out. It’s time we just stop watching movies and television shows that promote violence or hatred, or that disparage or degrade one gender or the other, no matter how humorous we find them, or how cool the special effects are. It’s time to realize we are what we eat. And what we read, watch and listen to as well. Summer is a great time to change things up, especially for families with kids still at home. During the summer, television is mostly re-runs, and we can easily unplug and tune into other family activities. Introduce your kids to small doses of vintage TV shows and movies that hearken back to a time when people spoke civilly to one another and put others needs ahead of their own. Spend lazy summer afternoons re-visiting classic stories – favorites or even those mandatory stories back in school. By the time fall rolls around, maybe your literary “tastebuds” will be adjusted and you might find those must-see movies and shows don’t hold your attention like they did before. Admittedly, I’m looking forward to the return of Dallas later this week, in all its outrageous trashiness. But it is and will be a miniscule part of my daily “intake” of thoughts and ideas. And frankly, I’m prepared to kick it to the curb in a heartbeat if it doesn’t live up to my expectations for fluffy fun summer fare. Here’s a to a summer full of good food for thought! Yes, the title is a Forrest Gump-ism. My apologies to Forrest, but it sounds like something he might have said, doesn’t it? A few days ago, I saw where the Supreme Court is being asked to weigh in on the FCC’s guidelines and fines. Basically, the case would open the floodgates to the broadcast networks to show and say anything, just like the cable networks. Not too long ago, I came across an online discussion regarding offensive language in a prime-time television show. Someone raised an objection to the proliferation of “G-D” bombs in a new USA Network original series. I happened to see several episodes of the series they were referring to and also found the inclusion of this particular phrase to be gratuitous and crude – it wasn’t uttered in the context of a heated outburst, it was a casual adjective tossed in and repeated numerous times, like a kid who has learned a naughty word and looks for every opportunity to use it in a sentence until he gets scolded. But apparently, the majority opinion – at least in that little fishpond/forum – was that this phrase and others of its ilk are now commonplace in modern society, and anyone who objects to them is either geriatric and/or too sensitive for their own good. And the old-school folks would do well to get used to such language. Or turn off their TV. Really? That’s their best argument? For too long, I think we’ve accepted the idea that if we don’t like something, it isn’t our place to render judgment, but we should simply leave it for those that do. That advice might be fine for the buffet line, but when it comes to what comes to us through our radios and televisions sets, just how long do we continue down this path before the only recourse is to shut ourselves in our homes and tune out the rest of the world, figuratively and literally? As a kid growing up, any potty-mouth phrases were met with–at a minimum–a stern, “Don’t be vulgar” rejoinder from any adult within earshot. And so I always equated the word “vulgar” with coarse, crude language. But its core, vulgar (vulgare, vulgaris in Latin) means “common.” I guess it is fair to characterize offensive words and phrases as vulgar – sadly it seems they have truly become truly common and commonplace. Does life imitate art, or vice-versa? if it’s life imitating art, then screenplay “art” has a moral imperative to inspire us to be better than we are. If art imitates life, then that’s a pretty sad commentary on what the writers see when they view the world. Maybe they should get out more, or at least become a little choosier about the company they keep. Maybe someday televisions and movies will come up with the “novel” idea of holding up a more enlightened and refined vision of humanity to us, instead merely echoing what is coarse and crude and well….vulgar. If they do, let’s not spoil it for them by reminding them they’ve gone back to the “good old days” when only movies were allowed to have any bad words and the earliest adopters of coarse language even had to pay a fine to the FCC to include those particular phrases. Until then I guess I’ll keep picking and choosing what to watch from a shrinking pool of possibilities. For most of us, we have a few movies that are inextricably intertwined in our holiday traditions. Some of them are sentimental favorites while others provide a refreshing (even bracing) antidote to the overload of Christmas cheer. Here are a baker’s dozen of my favorites. So far I’ve caught #1, 2, 3, 8 and 11; I’ll probably make time for a few of the others over the next couple of weeks. It’s a Wonderful Life (1946) What’s not to like about George Bailey and his truly wonderful life? A reminder that what is important in life is certainly not what’s in your bank account. White Christmas (1954) Purists snub this for the original black and white “Holiday Inn” but I like it, awkward lines and all – it’s worth it for the songs. A Christmas Carol Many versions have been done, but my favorites are the 1984 version with George C. Scott and surprisingly, the 2009 animated version with Jim Carrey. I guess I just didn’t think he could pull it off, so I went in with low expectations and came away entertained. Charlie Brown Christmas (1965) Great animated holiday movie and a timeless, fantastic soundtrack performed by the Vince Guaraldi Trio. How the Grinch Stole Christmas (1966) is probably my favorite animated holiday movie. For children, it’s a little dark, but as an adult, I appreciate it, much like I appreciate the bite of good dark chocolate, too. Can’t say I’m a huge fan of the 2000 remake with Jim Carrey, but it’s passable. The Santa Clause (1994) is probably a sentimental favorite because we took our boys to see it just before Christmas, back when they were still little and believed in the big guy in the red suit. Music like ZZ Top’s “Sharp Dressed Man” helped it along. The Polar Express (2004) is an enjoyable movie to watch for its technical feats as much as trying to spot Tom Hank’s multiple characters. Emmett Otter’s Jug Band Christmas (1977) was a Jim Henson animation that doesn’t get much air time. I watched it dozens of times on HBO back in the early ’80s and liked it even though it is high on the cheese factor. You’ve Got Mail (1998) is both derivative and a remake, but I like it despite those character flaws. Meg Ryan and Tom Hanks and a sweet dog – what’s not to like? 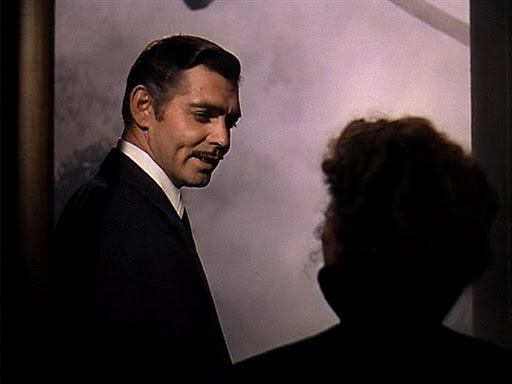 Alternate choices are “An Affair to Remember” (1957) and “The Shop Around the Corner” (1940). Stepmom (1998) is not usually considered a Christmas movie, but I think it fits the bill nicely. Watch it and see if you don’t agree. Be sure you have some tissues handy when you do. A few other honorable mentions would include “Jack Frost” “Family Man” and “Hook” – all are cautionary tales (especially to dads) to live purposefully and put first things first. For those of you who were expecting to see “Elf” on this list, it was no oversight – I snubbed it. Other than a few memorable lines (“You sit on a throne of lies….You stink. You smell like beef and cheese…”) I can totally forget it. Will Farrell in tights? ’nuff said. So what are your favorite Christmas movies, and why? If you don’t have any favorites, I hope you work a night or two sweet and funny movies into your family traditions. The quotable lines will become part of your family’s shared language and bind you closer together.